"Five Little Monkeys Jumping on the Bed" is a young children's song and game the origin of which is unknown. Kids love this popular chant and there are a number of storybook versions of this chant available. I chose the version by the popular Youtube Channel- Chu Chu Tv which is a favorite with the birthday boy. 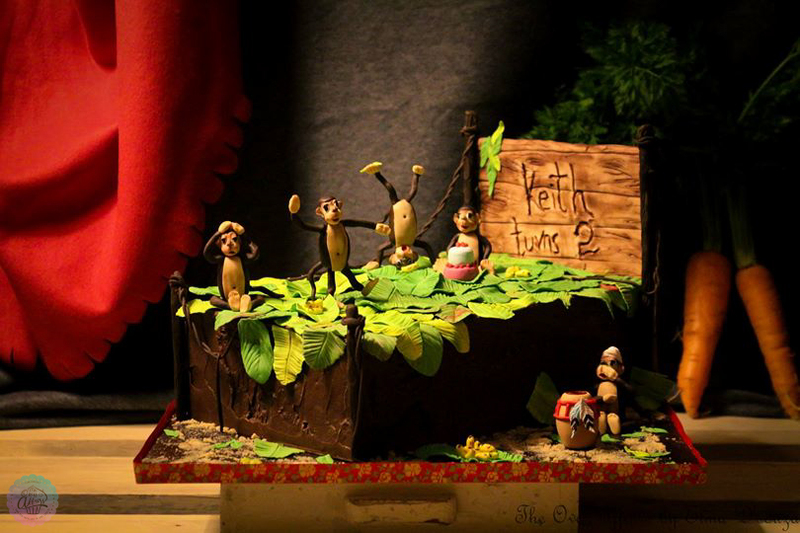 A Red Velvet cake layered with Cream Cheese frosting & frosted in Ganache.The various elements of the cake-monkeys, leaves, Jungle themed bed, music drum has all been handcrafted in Gumpaste and handpainted in edible colors.Made for Keith's second birthday as requested by his parents Sumi & Renu Abraham.